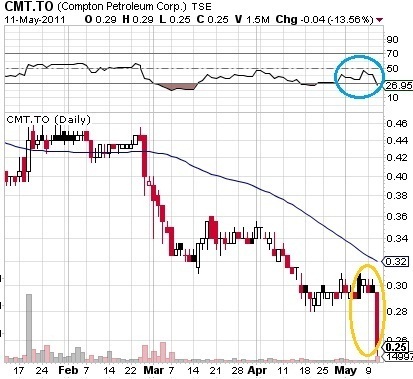 The shares of Compton Petroleum Corporation (TSE:CMT), (PINK:CMZPF) slumped heavily on the Toronto Stock Exchange (TSE). No reasons for that can be easily pointed out as no company news have been released for some time now. In such cases, we might suppose that somebody is dumping the stock. Or, perhaps, investors still pay attention to the negative financial reports for the past year filed in February. Back then, Compton announced a net loss of $331M, a 40% decrease in total proved reserves, together with a 48% decline in their value. Perhaps, shorters can be blamed for the heavy decline. Perhaps, the recent decrease in the oil price has contributed to the negative share performance. Perhaps, investors were disappointed by what they heard on the Annual General Meeting of shareholders. The event was held this Tuesday. Perhaps, perhaps, perhaps... Too much of "perhaps". There is nothing certain. We are simply guessing. As though trying to find the path in the dark. The company has not shed much light to chase away the darkness. Has anything remained hidden from the public? Why do traders have no trust in this company? Can the corporation take measures to turn things around for the better? Too many questions. Too little answers. The answers are needed indeed. Yesterday, CMT plunged down by 13.6%, dropping to $0.255 in the end of the session. The fall was reinforced by the large turnover of 1.5M shares, exceeding more than four times the average. I hope you do not feel too depressed after all the negativism stemming by far from the article. The corporation is not in collapse at all. Compton reported increasing revenue and a rising gross profit for the last quarter of 2010 in comparison with the previous three-month period. It is high time the company came out with a positive release and some big news in order to earn back the trust of investors that seems lost at present. Compton Petroleum Corporation Stock (TSE:CMT), (PINK:CMZPF) A Calm Before the Storm? Compton Petroleum Corporation (TSE:CMT) (PINK:CMZPF) Trades on Rumors? This stock is consistently heading down after dropping from NYSE exchange. I saw the presentataion they put together for GM a couple of days ago...Looks like they are certainly running out of options at this point. I don't know what is going to come out once the dust settles. Unless Mr. Granger has a trick still left in his sleeve, I am not very bullish about a spike or stock price going up from here on out...Investment in this stock has been nothing but a DISASTER!!! I guess we live and learn huh!! !